What chisels should a new carver get ? I suggest alternating the numbers and staying with “smaller” sizes. But I wondered , just how much damage could someone do with this selection and just what is possible to carve,O.K., I’ll find out? Leaves seemed to be popular, but I like Acanthus and some thought I make them look easy and they would like to try them,O.K.I’ll do those. So I had a slab of Mahogany, would have used basswood but this was handy, all one piece,1 1/4″ thick 11″ wide 20″ high.So I took a few minutes , sketched a quick design, since it’s symetrical you only have to do half.Layed it out on the wood , cut it out, and the second installment is on the second post.By the way,,I don’t own any dog legs or any sort of hold downs ,never did. I use tape , a piece of ply, and a couple of “C” clamps,easy, fast,, doesn’t get in the way nor mar the carving,and most can get tape and a couple of ”C” clamps pretty easily and you can clamp it ANYWHERE you want or take it with you, don’t gotta have a carving bench doing it this way( I don’t have one of those either). Hello Peter. First ,, thank you for the kind comments. I wasn’t quite sure how a “philosophy of carving” would work as a section on the blog as most want a ABC type approach to carving instead of the thought process that needs to be developed to allow carving to happen. A not so subtle but very important distinction in my “book”. But it seems in some minds to generate some thought. I won’t be able to , in just this reply , to delve too deeply into the topic. I have on another site gone into more detail in a tutorial on carving leaves for example, but I can’t retrieve that thread to post here. In essence what I believe should be happening in a carving is that the elements should seamlessly blend and transition from one point to another. Now this is more important and visible depending on the type of carving you are doing. 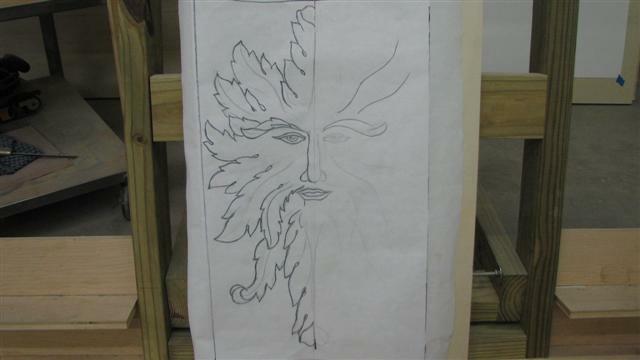 Leaves, flowers,vines, and in this case the Greenman this flow is more apparent. You are essentially looking to create lines that allow your eye to follow them without interruption. This is where odd lines taking off as a tangent,,or an odd kink or something like that catches your eye and interrupts the smooth flow. “S” shaped line are also more pleasing to look at even if it’s subtly done. The leaves on this particular carving are all based on an “S” shaped line. Nothing is straight or simply curved. Though simple curves have their place as well if you consider the graceful curves of a Nautilus shell, especially one that has been split in half. Sweeping curves, changing radius’s,,”S” shaped lines all tend to give a visual feeling of relaxing and softening visually. Imagine a hard straight line,,now just curve it a bit..and now gently push it into a graceful sweeping “S” , even an “S” where you have pulled both ends almost straight,,it just looks better than a straight line. Now if a number of these lines are gathered at one end as if in the center of a volute,, or radiating from a general point you can fan them out,or let them gradually fan out..start from a short tight curve and as they progress they get longer , not as tight,,but maintain a flow from a given point and OVERALL give the appearance of movement as a mass. Now these individual lines , once you have them flowing together and complimenting each other can be added on to. These lines are now the basis for hair flowing from a womans head..the veins for a collection of leaves spraying across the front of a mantle,,or the main lines for Acanthus leaves. They are all the same lines that work together,,but by adding specific details they can become anything you wish. A visual would be much more helpful as a description is difficult for something you need to see to be able to say ” OH,,Now I see what you’re saying” and be able to show specific examples. I think another Philosophy of Carving story is in the near future. Thank you for asking,, as well as visiting our site. I like to think that the tutorials..the projects,,as well as the thought behind carving makes for a well rounded and somewhat unique blog. Mark, I understand. I also found your leaf tutorial so I have the visual references. Other carvers have told me this in the past,mainly referring to detailing fur and hair. 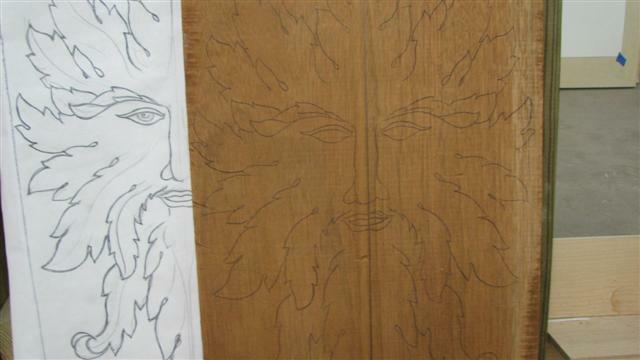 I now realise I should apply this principle to all aspects of my designs.I have been told that my woodspirits have flow. I think where I lacked flow is in my chainsaw sculptures, where the tendency is for straight cuts. Thanks a lot for clearing that up. Ahhh,, I’m so glad! A “teacher” shouldn’t instruct,,a teacher should inspire. Hearing that you understand makes all the difference in the world. You now KNOW. 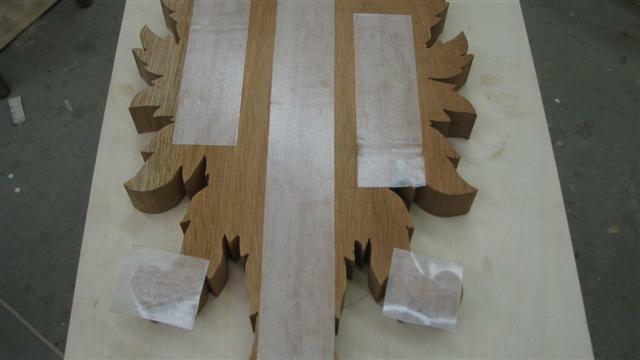 You see the common pattern that you can apply to ALL aspects of your carvings. From doing fur,, to leaves etc. If you simply follow what a teacher did,, you learn nothing. You only copied what they did. You don’t internalize it. If you’re inspired, you now know,, you SEE how it applies. Nothing will look the same to you as you begin to see the flow in nature,,forms, your carvings. This is what makes them live. It’s an applied direction to yield a natural looking fluidity. It’s false,, but true. Hence the expression,, “art is a lie, that leads to truth” Philosophical? YES.. Applicable? Absolutely. You now see it.Can I teach it to you? NO. But once you see it, you see it in everything. When I use these principles of flow,, I can apply them to laying out the feathers on the side of a duck,,to leaves, to designing an Acanthus leaf,,to even yes.fur. THE LINES ARE ALL THE SAME, FOR ALL INTENT AND PURPOSES. Flow is flow. Once you see it you can apply it to everything. Once it becomes internal it’s natural for you to express it externally. It’s part of you now. That my friend ,, is carving! It will take a fine carving,, albeit stiff and somehow not quite right,, to looking soft, fluid, moving with doing nothing more than making it’s lines flow. Even a beginner ,, with sometimes awkward cuts ( easily corrected) can impart a feeling of life, movement, grace and unity that without these elements would look,, well,, stiff, lifeless. And the movements of removing wood are still the same. Nothing has changed. Removing wood is removing wood. Same way I do it as well as a beginner. Another class,, book,, tool ,,, practice will not accomplish what you have just realized. Does it matter now if you have the “right” chisel? OR Chainsaw? Or latest book,, or tool, or class,, or book? No,, you just make it appear naturally with whatever you have in your hand. It appears because it’s part of you. Not something you’re trying to apply from a recipe. Your eyes! That’s where it all starts. Once you see it, it all flows from there. Your mind,merely a translator , relay’s it to your hands. How do you sharpen them? By repeated looking , seeing and finding it in nature,, other art,,etc. It’s all around us but we fail to understand it. But it’s not “understanding ” in the conventional sense. It’s an understanding in an experiential sense. You feel the movement without thought. It’s not applied knowledge that you incorporate or use. I can’t just take an “S” shape for example, throw it on a carving and expect it to work. Right idea ( thought) but wrong application. Again,, trying to “know about” something thinking you’ll find the answer is like mistaking the finger pointing to a destination as the destination itself. Or following in someones footsteps is the path itself. Either of these applications are false and lead you no where. This isn’t something where a particular tool will accomplish the task. As I said, it doesn’t matter which tool you choose to use. They have nothing to do with it. Once you see what needs to be done, you’ll find the tool to accomplish the task. Don’t go at it Bass-Ackwards.